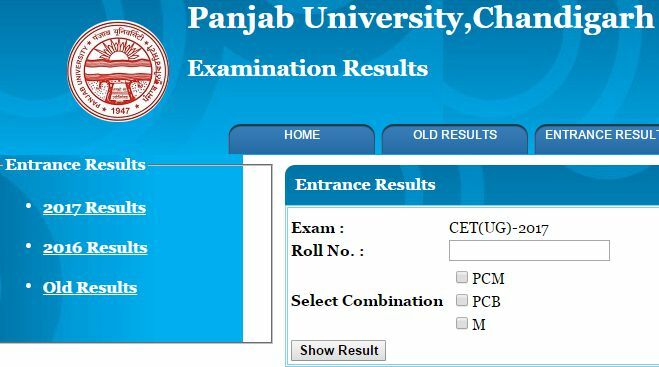 PU CET Result 2017: The result of Panjab University CET 2017 has been announced at results.puchd.ac.in. Candidates can check their PU CET (UG) 2017 Result and merit list download from 18th July onwards. The candidates who had appeared in the examination on 4th June 2017, may check details about PU CET 2017 Result from this article. PU CET 2017 (UG) was conducted by the Varsity on June 4 for admission to B.Sc. (Hons.) (Choice Based Credit System) and B.Pharmacy courses offered at PU Campus. The applications for UG entrance test were submitted from April 18 to May 17 while the exam was conducted on 4th June in Chandigarh. After the conclusion of exam, the University had published the answer keys on 6th June. The objections against the published answer keys were submitted till 1 pm on 8th June. PU CET result 2017 are set to be announced today. 1. Physics, Chemistry and Biology. The cut off percentage is 15% of the total marks. Only in the case of candidates belonging to Scheduled Castes / Scheduled Tribes / Backward Classes / PwD candidates, this requirement will be a minimum attainment of 10% (cut off) of total marks. Admissions to various courses shall be made on the basis of merit only. (d) The CET Percentile Score of the two streams will be evaluated independently. PU CET result 2017 will be available at cetug.puchd.ac.in and also at results.puchd.ac.in. The candidates will have to check the result from these portals only as separate result cards will not be issued to any candidate. My marks in pu cet is 78 and I got 85.5 percent marks in 12th standard can I get admission in bsc chemistry? my marks in pucet is 65.5and percentile is 40.25 and i got 86.6percent in12th standard and also i have one quota of one of the two girl child of my parents, so can i get admission panjab university. please sir tell. Got 45.6 percentile in cet and 12th marks 79.3.can i get admisson?i am a medical student.